Sunday morning, May 31, recorded the beginning of the most disastrous flood in the history of Kansas City. Great torrents of water swept down the Kaw and Missouri Rivers until the valleys were one raging mass of water from bluff to bluff. All the bridges spanning the two rivers at this point were swept away, completely isolating the city from all outside communication. 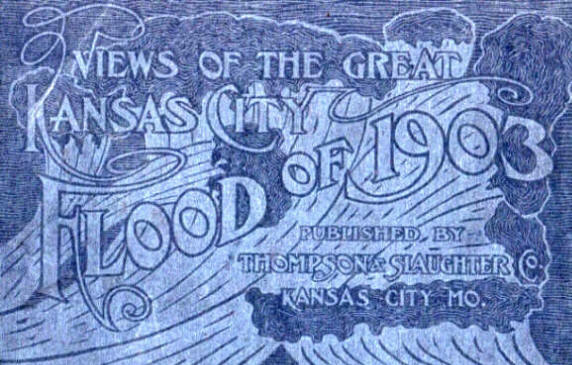 The East and West Bottoms manufacturing, wholesale and road districts were covered with water to the depth of from six to twelve feet. To add to the horror of the situation, box cars filled with slack lime caught fire and quickly spread to adjacent buildings. Firemen were powerless. Conditions were grave indeed, as the city was in danger of famine and disease through bad sanitation. Every one was at the mercy of thieves and fire. Authorities immediately called out the full Third Regiment, giving orders to shoot every thief and firebug in sight. Hundreds of lives and millions of dollars' worth of property will be lost in this flood. No exact estimate can be made until the water subsides. It beats the former flood of 1844 and stands as one of the most appalling disasters in the history of our country. 611 Delaware Street, Kansas City, Mo.